It is a necessity in today’s world to have a reliable means of assessing the people we trust to keep modern society functioning. And a reliable means is available in many important areas thanks to the International Organization for Standardization, or ISO. Since its inception in 1947, ISO has published over 19,500 International Standards covering many widely-ranging industries. 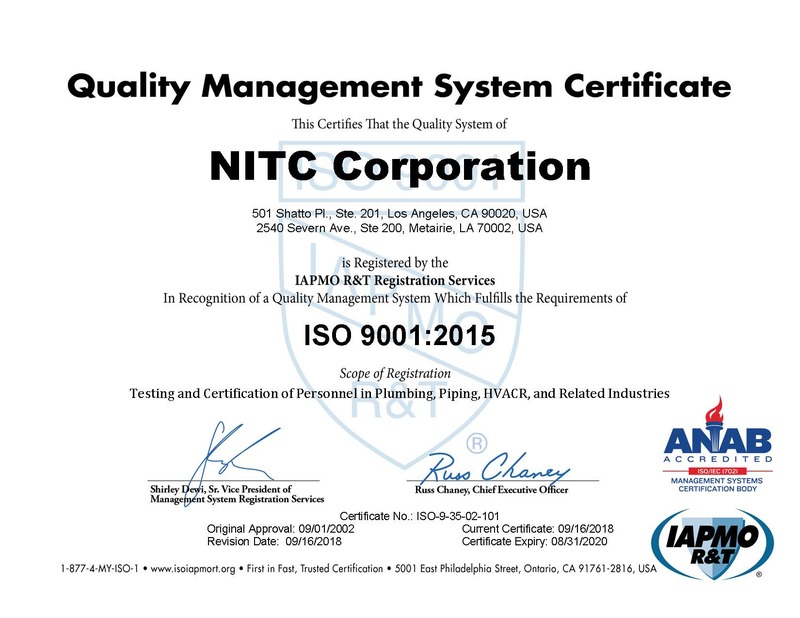 In documenting its own role as a reliable provider of personnel assessments, National Inspection Testing and Certification (NITC) maintains its certification to the ISO 9001:2015 standard. This highly-regarded standard establishes the requirements of a Quality Management System (QMS). A QMS is defined as the “way your organization directs and controls those activities which are related either directly or indirectly to meeting customer requirements.” The ISO QMS model results in the continual improvement of products and services a business offers its customers. 1: The establishment of a framework for continual improvement and customer satisfaction. 2: The ability to provide technical support for regulators. 3: The transferring of good managerial practices. Individual and organizations seeking certification for HVAC or plumbing tradespersons, should take a close look at NITC’s STAR level certification exams. All can rest assured that ones who pass these rigorous exams can be counted among those trusted to keep modern society functioning well. Therefore, whether you’re a training director, association representative, employer representative, or an individual applicant, the National Inspection Testing and Certification Corporation (NITC) is there to help advise you along the way. Contact Nationalitc at (877) 457-6482 to learn more about how our products help prepare the most qualified, most reliable, and safest trade professionals possible thanks to our wide range of industry certifications. We can help you and your business exceed customer expectations. Have your personnel certified with the certification company, NITC, today!